Coffee and wine. Both are social elixirs. Both provide a reason to get together and share conversation, laughter, and tears. 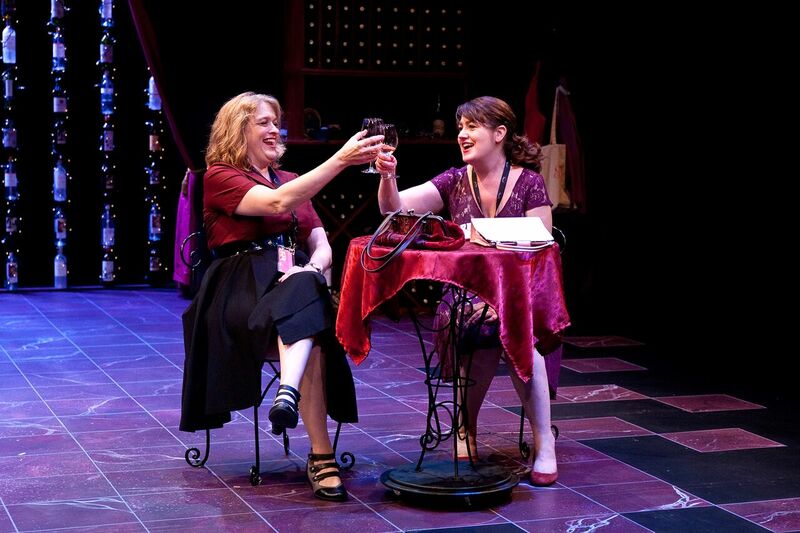 The brilliant #TCTheater comedy duo Shanan Custer and Carolyn Pool have chosen these two beverages around which to create their Ivey Award* winning sketch comedy show 2 Sugars, Room for Cream and its follow-up, Sometimes There's Wine. 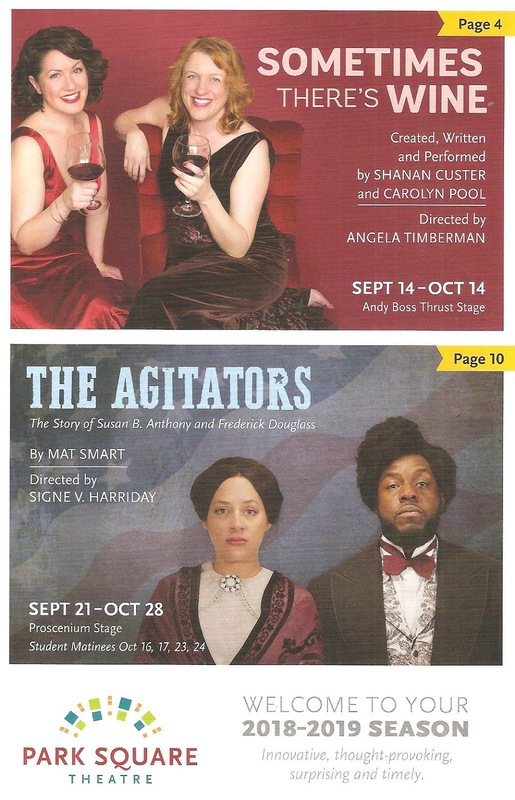 ** Both originated as Minnesota Fringe Festival shows (under an hour in length) before being developed into full-length shows. 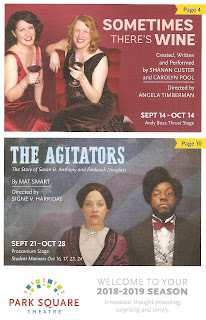 Sometimes There's Wine was a hit at the 2016 Fringe, and the full length version is premiering at Park Square Theatre to open their 2018-2019 season. Carolyn and Shanan are two of the funniest women people in #TCTheater, and have such a great and comfortable rapport with each other that it easily translates to the audience, bringing us into their circle. After the show my friend said to me, I want to have a glass of wine with them! But in a way we already did. Seeing this show feels like having a glass of wine with your best friends, who just happen to be super talented, smart, funny, real, relatable, charming, and disarming. 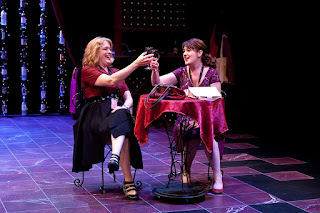 Go have a glass of wine with Shanan and Carolyn through October 14 at Park Square's second stage in the basement of the Historic*** Hamm Building in downtown St. Paul! Sometimes There's Wine could more accurately be titled Always There's Wine, because wine factors into every situation sketch in the show. Some of the sketches recur a couple of times, like the two sisters at their brother's wedding, in which one of them is a bridesmaid and one of them is the guest book host because the bride hates her. Wine help us! Then there's the woman who lists all of her ailments to her doctor, including wanting to drink wine all the time, only to be told that her diagnosis is she's 45 (it's funny because it's true). And what book club is complete without wine?! In fact most book clubs should just be called wine clubs, but at this particularly book club meeting two women commiserate at being at the less cool book club. Another couple of scenes are at a family Christmas dinner (including one in which Shanan adorably plays an 11-year-old), the kind that usually requires wine for survival. In a couple of sketches Carolyn plays a server, who is happy to share the comfort of good food and drink with her customers (sometimes) and bonds with the newly divorced woman who just wants the house red. "Do people like this?" she asks, which is typically how I react to my first sip of wine, until it improves in taste a few sips (or glasses) in. And don't worry, there is not just metaphorical prop wine, but also real wine at concessions in the lobby. Carolyn, Shanan, and director Angela Timberman (herself a very funny performer who has recently shown talent as a director to shape the funny) very kindly make wine/snack pairing suggestions in the playbill, something I've never seen before, but makes total sense here. Sometimes There's Wine is funny and real and feminist (why do women always say sorry? why is Viagra covered by health insurance but the best mammogram technology is not?). You're guaranteed to laugh and have a good time, and likely also see yourself in something and be touched by the humanity of the situations and characters that Carolyn and Shanan have created and portray. *In case you haven't heard, the 2017 Ivey Awards was the last one, they are no longer happening. But a new awards show has sprung up to take its place, and is still being developed with community involvement. You can attend the inaugural Minnesota Theater Awards this coming Monday (September 24) at Aria in Minneapolis. Click here for more info and to order tickets. **Carolyn and Shanan are currently developing the final installment in the trilogy - Bad Things, Good Whiskey. Stay tuned! ***Speaking of historic, #TCTheater history buffs will not want to miss the exhibit at the Landmark Center on Park Square's 40+ years of creating theater. There are some amazing photos of beloved actors past and present, as well as props, costumes, playbills, and set models on display. I've only been attending Park Square shows for about 10 years or so, and it looks like I missed out on a lot! The exhibit is near the 6th Street entrance to Landmark and is open during Landmark Center open hours through September 28.